If you’ve been finding it hard to maintain your lawn in good health and keep an excitable pet happy, we have the perfect solution for you. If you feel like you have tried everything but can’t seem to find a way for your pet and your lawn to co-exist harmoniously, then it’s time for a change. Artificial grass is perfect for the casual dog owner as well as for pet care facilities, dog runs, and commercial animal care centres. Premier Custom Grass systems have been designed to be both beautiful and durable for pet use. All of our systems have been tested and used extensively with multiple pet facilities to make sure they are safe, reliable and long lasting no matter how many or how large your pets are. Your lawn is fundamental to how your outdoor area is perceived and if you are like every other homeowner in the GTA area, you most probably long to have a lush green manicured lawn that you can be proud of. However, when you have a pet things are never that simple, which is why you should consider utilizing our cutting-edge artificial grass in your yard. Pet’s Stop Digging – Dogs in particular love to dig up grass, which can spoil the appearance of your lawn, but once our specially designed artificial grass is laid down they won’t be able to penetrate its surface and will often give up within a short period of time. Urine or Stool Doesn’t Affect the Grass – Your lawn is often where your pet will go to do its “business” and while this is necessary, it can actually severely impact upon the health of your grass. This is not a problem for our artificial grass however, as it is resistant to lawn diseases and the chemicals found in pet urine, which safely drains away to prevent odours from lingering. Keep Them Clean – When it rains your lawn can become muddy and provides conditions that most pets relish. What they don’t do however is clean up the mud they trail inside your house. With pet turf there’s never any mud. 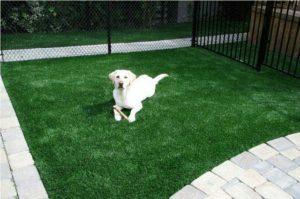 In addition to proving to be one of the most effective solutions to playful pets, ensuring they can enjoy the outdoors without compromising the visual appeal of your landscaping, artificial grass provides many additional benefits for Toronto homeowners, such as removing the need for regular maintenance and reducing water bills significantly.